1. Thank the person who nominated me for this award. 2. Copy the award and place it on my blog. 3. Link to the person who nominated me for this award. 4. Name 6 things that people might find interesting. 6. 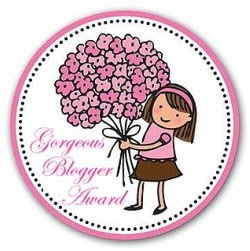 Post links to the 7 blogs I nominate. 1. The year before I met Dan I went on dozens of dates most of them were crazy and one guy brought a gun! I was embarrassed to tell people that I was online dating, so I kept saying that I was set up by ‘a friend’ and gosh my friends were all concerned about what kind of friend would do this to me! 2. I played the clarinet in elementary and middle school. I was in the high school marching band for one semester and I haven’t touched the clarinet since! 3. I have to wear sunglasses when it’s sunny. I hate being outside without them on so I wear them on my head at all times. 4. Growing up I wanted to be a marine biologist, I even got internships/jobs at the local zoo. 5. As a kid my parents wouldn’t let us eat sugar cereal on a regular basis, however, they’d let us pick a sugar cereal of our choice for our birthdays. To this day, I remember picking Strawberry Shortcake cereal when I was 6 or 7. 6. I love sea glass or crazy glass. My grandmother taught all of us to collect it. Dan and I used blue and white sea glass as a main theme/decoration at our wedding, partly because I love sea glass and partly in memory of my grandmother.